The Land of the Snow Leopard (LOSL) Network, now in its third year, is part of a groundbreaking collaboration between Western and Indigenous science. Our goal is to create pathways for Indigenous people to be equal partners in research and planning for conservation of snow leopards. 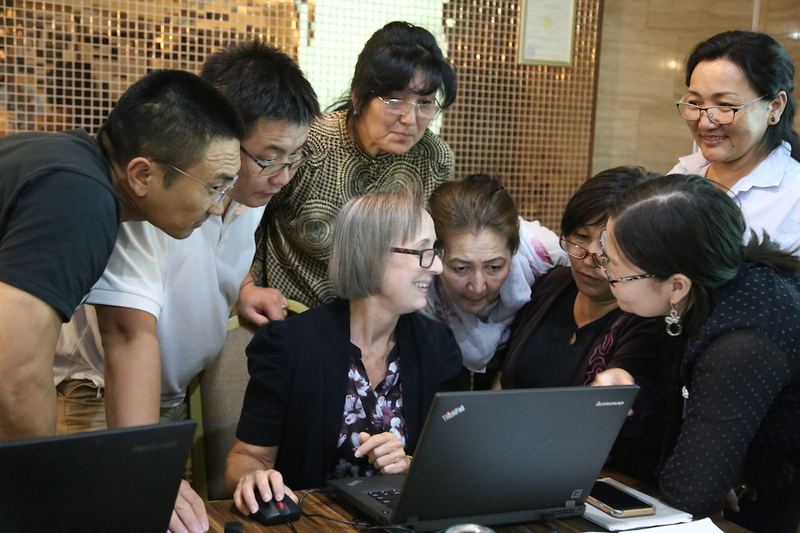 This past September, Rodney, Charleen, and I traveled to Bishkek, Kyrgyzstan, to meet with LOSL’s seven Country Coordinators and other key Network members. We wanted to work through some challenges of communicating in more than five languages and working in remote, mountainous snow leopard habitat across more than 600,000 square miles of the Altai Republic, Buryatia, Kyrgyzstan, Mongolia, and Tajikistan. In our program areas, the snow leopard is not only a flagship species for biocultural diversity, it is the axis mundi of ancient traditions, legends, and beliefs. These beautiful, mysterious animals are protectors of sacred mountains, a unifying force, and a source of spiritual power and wisdom. Despite the remoteness of their high-mountain habitat, snow leopards are vulnerable to human-caused threats across a wide spectrum. Most of these cats roam outside the relative safety of national parks or other officially protected areas. While ICPs serve as guides, the greater LOSL community includes lifelong herders who know the ancient practices for reading and living in their environment, indigenous educators, historians, scientists, and traditional hunters. The catalyst for this work is the Global Snow Leopard Ecosystem Protection Plan (GSLEP), whose leaders recognize that achieving the plan’s objectives will require collective action – including the full participation of local communities. The strength of LOSL is our knowledge and experience of the spiritual and cultural importance of Snow Leopards to the work of securing landscapes for their preservation. Our challenge is to help the Snow Leopard range country governments understand and embrace the Spiritual nature of Snow Leopard and it’s fundamental place in indigenous practices and knowledge of how to protect the species. Unique to this project is a platform that enables our members to collect interviews, stories, folklore, photos, and videos. Country Coordinators had collected a large amount of this culturally-important data, but they had encountered problems in getting the information onto our platform so it could be shared among the network members. Thus, we called the September meeting to deal with database management. Once we had solved the technical problems, we developed a system and form for summarizing and categorizing photos, interviews, etc. that were considered of cultural and/or spiritual importance. All summaries will be translated into Russian and English. This allows us to easily share the data, to identify commonalities, create reports, and develop tools for revival/preservation of traditional practices. No one has attempted this kind of effort before, to standardize the integration of culturally-important data into conservation planning and action for snow leopards. 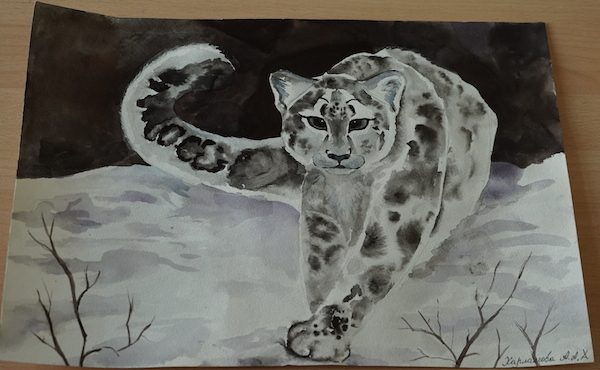 We discovered that ICPs and other LOSL Network members are already developing tools and taking an active lead in reviving traditional practices that save snow leopards. They are bringing new ways of learning about snow leopards to their local schools. In Russia’s Buryat Republic, the Baikal Buryat Center for Cultural Conservation followed the example of our Mongolian partner, Nomadic Nature Trunks. They introduced interactive conservation education through visits to all the schools in Okinsky Region. Norbu Lama, the local Buddhist spiritual leader, talked to students about the indigenous attitude towards nature, and how to record observations using our LOSL snow leopard monitoring App. The children at one school decided to write special love letters to snow leopards. Further, Norbu Lama worked for more than a year to achieve for Okinsky official designation as a Territory of Traditional Use of Natural Resources. The designation gives special management authority to local people. This means that they can now, for example, protest mining, forbid hunting, and establish tourism. The territory includes Mönkh Saridag Mountain, sacred to Norbu’s community and the highest peak in the Sayan Mountain range. 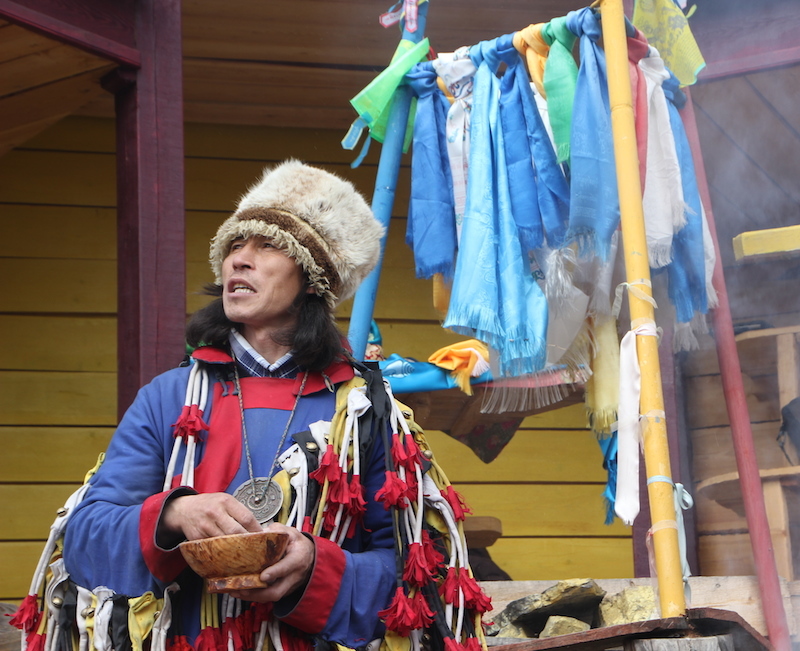 Mönkh Saridag is the site of Norbu’s annual community ceremony to honor Snow Leopard as their protector. 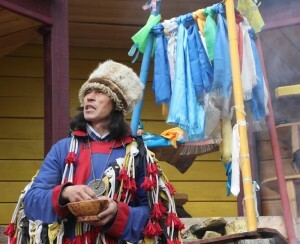 In Mongolia, Shaman Buyanbadrakh led the effort to establish Spirit Lord of Sutai Mountain in his home province of Hovd. The mountain is now officially acknowledged as a spiritual and cultural sacred site of the Mongolian Altai. In the future, we will be sharing some of the traditional stories collected by our LOSL Network members.